The iPad was finally released in Canada today though I've had one since release day in the U.S. As such I've had a month or so of special time with the iPad. Initially I was a bit doubtful on the form factor and use. This was largely due to the fact that my daily attire includes an iPhone and MacBook Air. 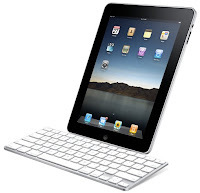 My first impression of the iPad was that it was a bit awkward, a bit underwhelming and just cool. Though after a month of use my opinion has completely changed. In fact, as a result my iPhone usage has changed dramatically and it's been almost two weeks since I've used my MacBook Air. In a very short amount of time, I've started using the iPad as a central device to my day-to-day operations. I take it into meetings, use it for presentations, general browsing, watching movies, playing games etc. I'm not sure if my iPhone has recently shrunk in size or my thumbs are five times bigger, but as a result my tolerance for watching content on the iPhone has diminished. The email experience is brilliant and I'm impatiently awaiting for some of my favorite iPhone apps to be available on the iPad. Though to me, the most impressive feature is how quick it is. In an instant it is on with no boot time, apps and access is slick. The battery life is just outstanding and it generates next to no heat. I have found the iPhone to get warm which is mostly due to it's size and being held in your hand so it has little opportunity to disperse heat. The one important take-away from this is that despite my skepticism, in a very short amount of time, it has changed my computing/web usage patterns. It's not perfect though I am sure there are many interesting enhancements on it's way. A few things are annoying but overall these are minor. I've opted to go without the 3G model (well, it wasn't available on release day) and will probably hold out until the next model comes out.